The first time I met Chris Hani was when I was trying to set up a meeting between him and the local Chamber of Commerce. At the time, I was in awe of the great man, and a little intimidated. I needn't have been, writes Glenn Bownes. 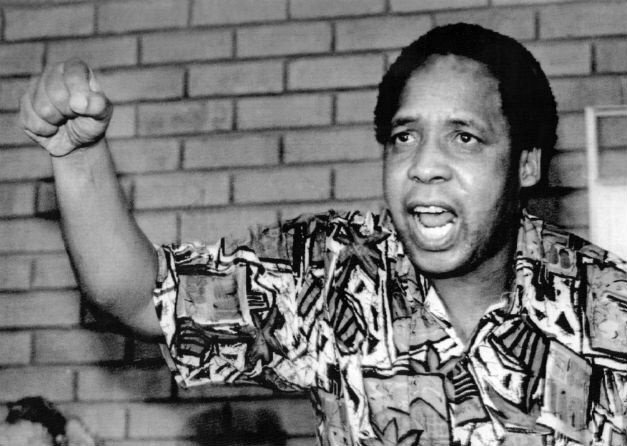 Twenty-six years ago today, Chris Hani was gunned down outside his Boksburg home in front of his 10-year-old daughter. When he was murdered by Janusz Walus on April 10, 1993, there were real fears that the negotiations to end apartheid would collapse, and that there would be serious violence on the streets. While there were protests and some violence, the country managed to survive this clear attempt to derail the move to democracy, in no small measure due to the wise leadership of the ANC. Nelson Mandela, in a public address to the nation, said: "Tonight I am reaching out to every single South African, black and white, from the very depths of my being. A white man, full of prejudice and hate, came to our country and committed a deed so foul that our whole nation now teeters on the brink of disaster. A white woman, of Afrikaner origin, risked her life so that we may know, and bring to justice, this assassin. The cold-blooded murder of Chris Hani has sent shock waves throughout the country and the world... Now is the time for all South Africans to stand together against those who, from any quarter, wish to destroy what Chris Hani gave his life for – the freedom of all of us." I had the privilege of meeting Hani on a number of occasions. I was working for the Institute for Democratic Alternatives in South Africa (Idasa) in East London in the early 1990s. A large part of my job was setting up meetings and discussions between representatives of the liberation movement with members of the apartheid regime and big business. The first time I met Hani was when I was trying to set up a meeting between him and the local Chamber of Commerce. He suggested we meet for a lunch to discuss how we would approach the meeting. I admit that, at the time, I was a bit in awe of the great man, and just a little bit intimidated. Hani put me at ease immediately and we had a fascinating 2-hour discussion over lunch, where we touched on everything from armed struggle to classical literature. Hani developed a love for Latin and classical literature at a very young age. But the fact that Hani impressed me (a supporter of the ANC at the time) was hardly surprising. What was incredible though was witnessing this leader of the South African Communist Party and Umkhonto we Sizwe chief of staff seduce white, conservative business leaders at the subsequent Business Breakfast that I organised. In fact, he was so popular that I was inundated with requests from business for follow-up meetings. When I say that Hani seduced them, I don't mean that he, in any way, pandered to them or their perceived interests. He was unashamed about the need to create a more just and equal South Africa, and for him that meant some form of communism or socialism. But his willingness to debate and engage, his extensive knowledge of the issues, and his incredible charm had them eating out of his hands. The next time I saw Hani was a week before the Bhisho massacre. There was a march on the "border" of the capital of the Ciskei Bantustan. There was a massive military and police presence and tensions were incredibly high. I was assisting with violence monitoring and was liaising between the security forces on the one side and mass democratic movement leaders on the other. While I was standing between the soldiers and the crowd, I heard my name being called. "Hey, comrade Glenn, how are you today?" I turned around and there was Hani standing behind me with a huge grin and an outstretched hand. I must say, I was blown away that he had remembered my name. He was in constant meetings with many important people every day. I was not important. I was later told that he had an almost photographic memory with names and faces. I also think it was because he was a fundamentally decent man and cared about the people with whom he came into contact. On that day, Hani and other leaders, like Steve Tshwete and Cyril Ramaphosa, managed to talk the two sides down and a very real possibility of violence was averted. Exactly a week later, on September 7, 1992, crowds gathered at the border again. This time, tragically, it turned out very differently. When marchers tried to cross "the line", Ciskei Defence Force soldiers opened fire. In the ensuing bloodbath, 28 marchers and one soldier were killed. More than 200 people were injured. I saw Hani once more after this. He was extremely sad and angry about the massacre, but said it had made him more intent on finding a solution that would end apartheid and white minority rule. We said goodbye and he said he would see me soon, as he was spending a lot of time in the Eastern Cape at the time. I never saw or spoke to him again. Seven months later he was dead. - Bownes is chief sub-editor at News24.